Evanston, Ill.—We’re journeymen, apprentices, semi-skilled, and lube techs. We do everything from oil changes to brakes, electronics, and suspension work— basically anything to do with a vehicle. Auto mechanics on strike, picket line in Evanston, Ill., Aug. 14, 2017. Photo for News & Letters by Franklin Dmitryev. 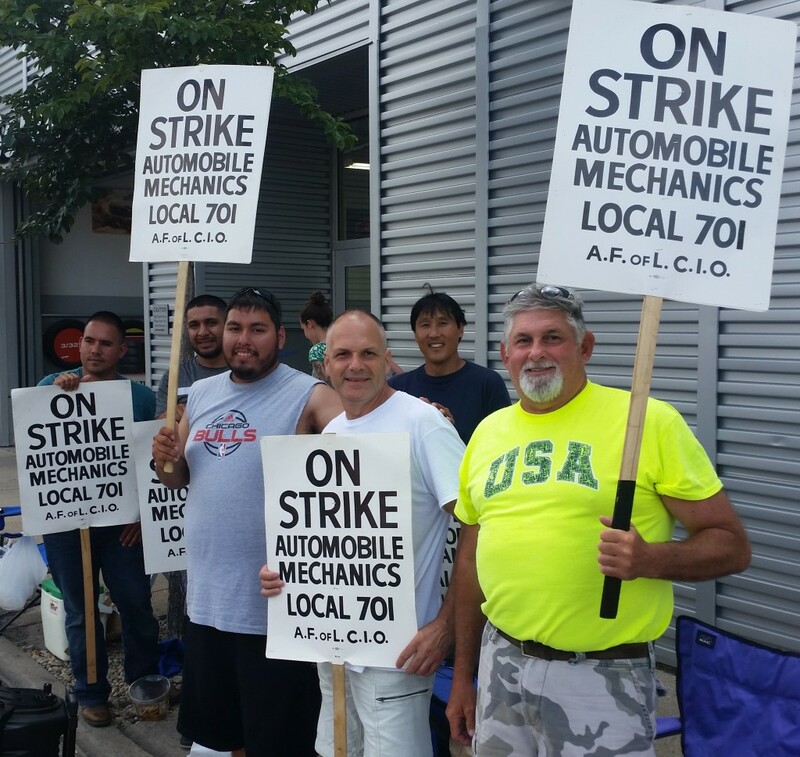 On Aug. 1 we went on strike against about 140 new car dealers in the Chicago area, for a better wage and to change the structure. It goes lube tech, semi-skilled, apprentice, and then journeyman. Journeyman is the highest position. Right now there’s no structure set up for the semi-skilled, so there’s really no time frame for when they can move to an apprentice. There used to be a four-year apprenticeship program. Now, it is an eight-year program. So students coming out of a trade school in their early 20s realize that if they’re semi-skilled, they will be in their early 30s before they’re going to become a journeyman. By that time, they want to have a kid or two, start a family, have a mortgage, and that’s hard because the time frame is so long. They can go to school and become a doctor in a shorter time. That’s discouraging for a lot of younger guys. I’m about to turn 30 soon, and if I felt it’s like that for me, I probably wouldn’t be in this business. The way it’s structured, lube tech, semi-skilled and apprentice are paid hourly. You start at $10 an hour. If you put in 40 hours, you get paid for those 40 hours. But for the journeymen, we have to be physically here 40 hours, but we only have a guarantee of 34 hours of paid work. A lot of times we’re only booking 30 or 32 hours. We’re trying to raise that bar so we can get paid for the amount of time we’re here. We get paid by the job. But the times have changed, especially the warranty time which has been reduced by almost every manufacturer. The technicians that we talked to are taking hits because they can’t even see what they get paid. We’re lucky enough to see what we get paid. As long as we replace the failing part—for example, a bad hub bearing—that pays us six tenths (of an hour), a little bit more than a half hour—no matter how long the work actually takes. GM and Ford mechanics don’t even see that, so they don’t know what they’re making until the end of the week, until their warranty administrator claims it and they get the money in return and the administrator says you guys get paid three tenths. These workers are playing the guessing game about whether they will take home a check for 30 hours or 40 hours. It’s so out of control that we’re fighting to get paid for the 40 hours we are here. In the past ten years, the rate the customer is charged for labor has gone up, I would say, an average of about $35 or $40 per hour at each dealership. But we’ve only seen an increase of 26 cents each year in the last 10 years. We have to pay $10 a week on co-pay for our insurance. That wipes out the raise. We’re asking for a fair wage, and to eliminate the co-pay. We’re asking for a better structure in setting up the semi-skilled and the apprenticeship program. We want to attract the good young adults out there that want to come to this field and learn. But the time frame is very discouraging. Who wants to come in at 21, 22 years old, and wait for 12 years when you’re already 34 to get to the top. We’re fighting for the younger generation, and we’re fighting for us as well, the older generation, so we can have a pension and retire. The people supporting us have been great. We’ve had people from the CTA union, the AT&T union, other unions, everybody’s reaching out to us; they brought us donuts and coffee in the morning. They’ve been saying stay and fight. Families have been very supportive to everybody. Strangers honk as they drive by, in the morning and at night. We’re here on the picket line as early as 7:00 AM until 9:00 PM. We’re not fighting for something unreasonable. We’re fighting so we can help our family succeed in life. I want my son to go to college and to have a better life than me. That’s what we’re fighting for. We’re fighting for the future. This entry was posted in Alerts & Appeals, Articles and tagged auto mechanics, Chicago, Evanston Illinois, labor, workers. Bookmark the permalink.